It shouldn’t go unnoticed that this article isn’t about “stuffing” it’s about dressing. Which to be fair is stuffing that is un-stuffed and rather baked in a separate pan. I know I’m going to get pasted for this, but I don’t care for stuffing. It comes out of the bird as a homogeneous brown mass, not to mention stuffing your turkey adds to the cooking time resulting in a dry bird. Because it’s not dependent on when the turkey is ready, you can make it in advance and reheat in the microwave. You can make as much as you want! 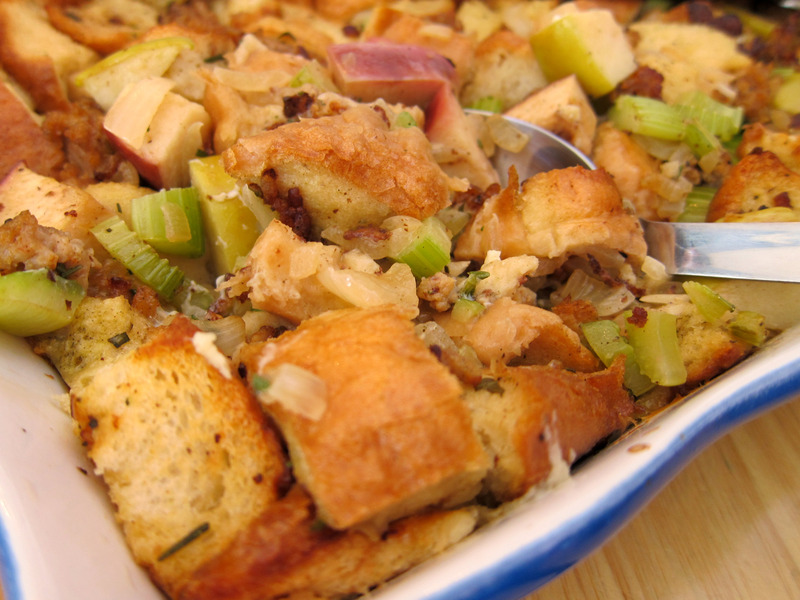 Much like Gravy, folks get grumpy if they feel cheated out of their fair share of stuffing. The recipe below might make you see things my way. Tear or cut the bread into chunks and place into a very large bowl; allow them to dry overnight. Brown the sausage and place into the bowl to cool. Chop the herbs and toss them in with the meat and bread. Melt the butter in a large sauce pan. Chop the onions, celery and apples, add them to the melted butter and cook until softened; about 3 minutes. Remove the vegetable mixture and place it in with the bread mixture to cool. Mix the chicken stock, heavy cream and the eggs together. Add 2 teaspoons of salt and pepper. Combine the egg mixture with the bread/meat mixture and toss well, making sure the bread gets moistened well. Scoop the dressing into a buttered baking dish and cover with foil. Uncover the dressing and bake for 25-30 minutes, until golden on top.